This entry was posted in Internets of interest on September 16, 2018 by Dave Cheney. This weekend I’ve been freshening up the introductory material for a workshop that Francesc Campoy and I are teaching at GopherCon this month. As part of my research, these videos have been on high rotation. The first video by Sophie Wilson, the designer of the first ARM chip from which both the company and the line of RISC microprocessors we know today were born. The second presentation by John Hennessy of Computer Architecture: A Quantitative Approach fame is a reprisal of the 2017 Turing Award lecture he gave with his co-author David Patterson. The theme of both presentations is the same; the end of Dennard scaling and the tremendous technical and economic challenges in bringing extreme UV lithography to the commercial processor production will cap the growth in processor performance to 2-3% per year for the foreseeable future. 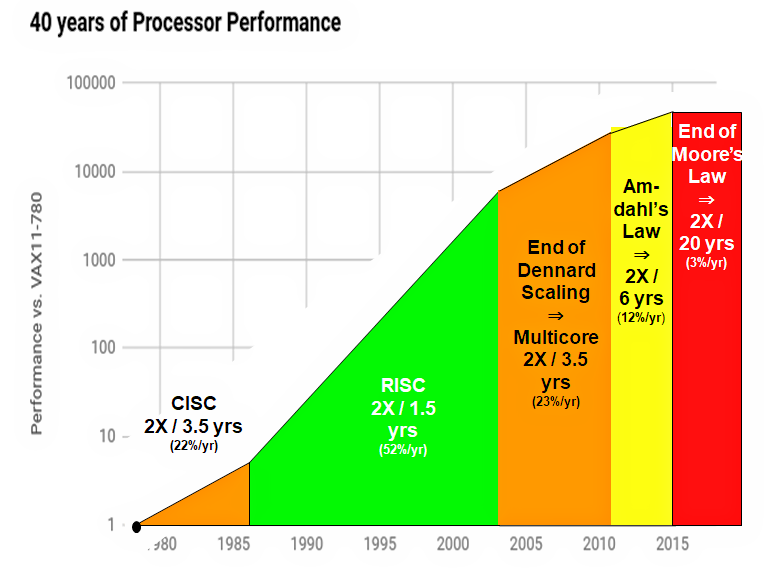 Both Wilson and Hennessy see the future of processor design as a gestalt of CPUs, GPUs, DSPs and VLIW architectures. Issue of adapting mainstream imperative programming languages to these architectures remains very much an open question. This entry was posted in Internets of interest on August 19, 2018 by Dave Cheney.